Today, the 22nd of September 2006, is the last day of the Grumman F-14 Tomcat. After more than 30 years of good and active service, it is being retired by the US Navy. There are many (ex-)pilots and military people who are still fond of the F-14 and some of them have even created a farewell website. I can say that the F-14 has had a major influence on people of my age. Have a look at the discussion on Slashdot for proof. I have so many good memories of the F-14. It was so impressive. When I was a kid, my dream was to become an F-14 pilot. With my cousin Aman, we improvised dogfights in the backyard mimicking the US pilots against Russians with their Migs and Sukhois. It was fun! Charlie: Excuse me, Lieutenant. Is there something wrong? Maverick: Yes ma’am, the data on the MiG is inaccurate. Maverick: Uh, sorry Goose. WE happened to see a MiG 28 do a 4g negative dive. Charlie: Where did you see this? Maverick: It’s classified. I could tell you, but then I’d have to kill you. MiGs own! During this year’s Farnborough airshow, I saw the MiG-29 in action. That thing can hang in mid air, drop like a stone and resume course! 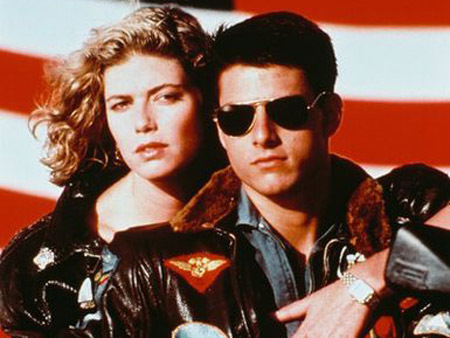 Top Gun for sure is a nice film :) I like it a lot too. Exit the Falcon, in cometh the Raptor. hmmm machines that can drop bombs on innocent civilians.. But dogfights are cool ain’t it, in games atmost. When politicians decide to start a war (i.e. in Irak) for very questionable reasons (i.e. in contradiction with what al-Baradei found there) and innocents are killed, I tend to blame the politicians instead of the military. I think I’ve built around three 1/72 scale models of the F-14 since I was a kid. I love that plane. The Su-27 and derivatives are beautiful as well. I still have an unbuilt F-14 model plane that I keep around for when I have too much time. Funny you say that because it’s the same for me. When I was a kid, I built (if I still remember): a F-104 Starfighter, a F-86 Sabre, a BAC Lightning among others. I bought a model Concorde in 1997 and I still haven’t built it! I’ll wait for my kids to become bigger. I’m sure they’ll love assembling it. Did any of u guys watch “Les Chevaliers du ciel”? i think the english working title is Sky fighters, it a french production, and according to some comments, the tagline say “Top gun for a new generation”, and other might say better than top gun..
well, i wouldnt argue that it is better than top gun, coz i know some of u grew up with top gun, bt surely, do watch this film, i personally didnt find the storyline that impressive, bt ya, the action sequences picture are imho one of the best, of course, being a french production, it involves Mirage 2000s, and i guess some of u might more fond of Uncle Sam’s fighters..
bt definitely, this film is worth watching..and till now, every1 who has watched it asked me if i had a flight simulatorthat i could give them..even i looked for a flight simulator, bt didnt get any better, Microsoft Combat flight simulator is too expensive for me,(and so are the others..) so i ended up with my old F22 Lightning of Novalogic..
Anyways, those of u who havent watched it, do watch it, and let me know wht u think abt it..i think i watched the opening dogfight sequence more than 50 times, Mirage v/s Mirage..this sequence was pretty breath taking..
TOP GUN is pure Rock MAN! I really love that film ! It´s my favorite ACTION-MOVIE. There are so many good memories. I watched Top Gun when I was younger. It inspired me to become a pilot and make a career of flying. I began with Cessnas, and now fly the F-18 Super Hornet. Any kid that wants some inspiration to become a naval aviator should have a look at this film! Interestingly, the Tigers featured as fictional MiG-28 fighters which never existed. Well i just came onto this site actually looking for pictures of my most favourite fighter plane and i instantly fell in love lol. I was also a big one the Movie Top Gun though i was very little when the movie came out (I was 2) but my father watched it alot and my great uncles and grandfather were in the military (mind you it was the airforce) so flying is in my blood and i’ve been addicted to it ever since! When i had been a young kid who was still really into Top Gun i joined the air cadets (for those of you who might be canadain) and worked to recieve my wings. It might not of been a 14-Tom Cat but when i was up in the sky i felt like it might as well of been one! When i got alittle older i went and got my pilots liecence and enjoyed it for some time. Sadly with the times so rough i only had it for a short period of time (1 year) before it became alittle expencive for me. I miss it but am always happy to see others who are like minded about flying not to mention about the movie Top Gun and my all time favourite fighter plane ever , The F-14 Tom Cat. I’ll miss it being retired but will always dream about getting a chance to climb inside one and fly away into the sunset! Thanks for this opertunity to write in such a cool site! Thanks Dominic for your comment. It’s always interesting to have the perspective of a real pilot. Do you still fly now? Sadly no it’s been a couple years since i have been able to be behind the stick but as i work on improving my life i intend to get back into it as i miss feeling the freedom the sky brings! Well I am just an eleven year old but my dad flew the F-14 Tomcat. I dream to be in the cockpit of one of those things. I have also seen top gun. I thought it was a great movie. It’s very sad that they no longer manufacture F-14’s. I want to become a pilot some day. I just stumbled upon this website looking for pics. but then i read the comments and decided i should leave one. I am a retired computer graphics designer. I am also a fan of the F-14 Tomcat and I have made several illustrations. 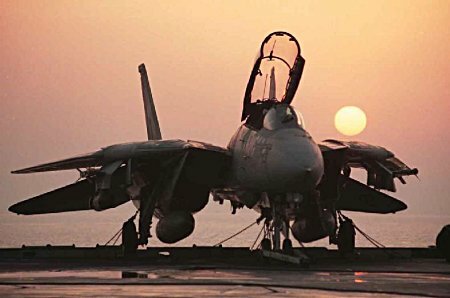 Please check out my F-14 Tomcat album on Zazzle. Nice to see that you also have some aviation interest, something which I miss in MRU is no aircraft museum. Let us be discerning pirates!